In case you missed it, we’ve pulled together snaps of Pride weekend in a scrapbook, if you will. Next time you’ll know better than the sit on your duff at home. 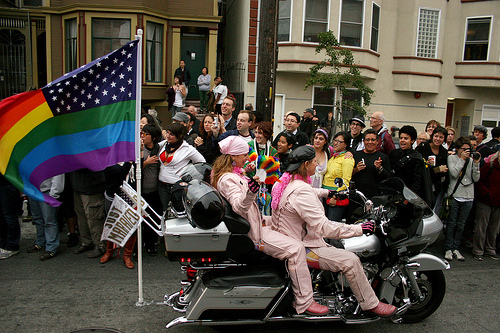 Above, some pinky dykes on bikes start us off on our queer journey. San Francisco LGBT Pride Celebration will explode next weekend with fanfare, parades, performances and plenty to celebrate. On Saturday, the Civic Center will host celebrations from 12 p.m. until 6 p.m. Sunday is the big draw with a parade down Market Street, starting at 10:30 a.m. The fun then continues until 7 p.m. The official Website has more information on events, from HomoHipHop to Leather Alley to Tantra Stage (unfortunately, not what you think it is). Even if you’re not queer, Pride is the city’s event of the year, and it’s not something to be missed.